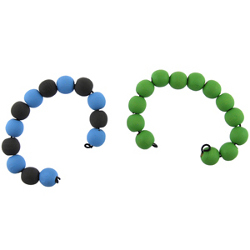 These easy beaded bracelets from The New Image Group make great gifts at any time of year. Try this free bead pattern in a variety of colors for your next birthday or celebration opportunity. Paint beads to desired colors. Let dry. While paint is drying, wrap twine loosely around wrist to determine amount of wire you will need to cut. Add 5" to length of string and cut desired length from annealed wire. 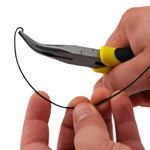 Curl one end of the wire with roundhead pliers to prevent beads from slipping off. String your beads onto the wire. Curl other end of wire and cut off excess with wire cutters. Summer is right around the corner and this will be a project to do with my granddaughter. She loves her jewelry and cannot get enough. I love the idea of the unfinished beads so she can use her own colors and designs that she likes. The tutorial is easy to follow too. Will anyone else be adding this to their summer craft list? I am another grandma that will be making these with her grand daughter. . I also think allowing them to come up with their own colors is great. It will teach a few lessons in coordinating and what colors go together. If I may add a suggestion. Add a small inexpensive charm from a craft store. Maybe her initial? That or a cat or dog charm? That would really set it off.